Shunichi Matsuba, a full-blown diorama artist, can create stunningly realistic models of everyday objects that are fractions of fractions of an objects’ true scale. 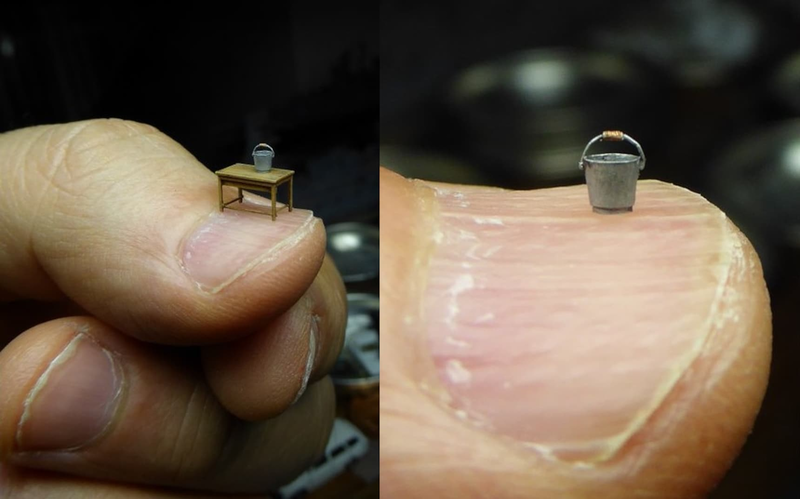 Ever seen a bucket so small it can perch on a fingertip, or a truck the size of a coin? What is even more stunning is the fact that Matsubata makes these things for fun. It’s not entirely clear what kind of materials Matsuba uses to craft his creations, although clues in a handful of his Twitter photos reveal many of the models are made from various thin metals, wire and plastics, while some pieces of Matsuba’s full diorama scenes are store-bought toys — like Tomica cars — which he’s painted over and deliberately “aged” with dents, rust and other flourishes. This house is scaled down to 1/150 the size of a a normal house. With such an eye for detail, he even included an outdoor water pipe whose diameter measures about 0.66 millimeters (.026 inches) across. So small are Matsuba’s models that he readily admits to occasionally dropping one under his desk—the tiny bucket or trashcan or whatever—never to be found again. There are also, apparently, a whole lot of failed attempts when working on a scale this small; although Matsuba says even some of his “failed” pieces find their way into dioramas as things like broken-down cars. It's truly amazing how remarkably similar his miniature models are to the real thing, as depicted in this side-by-side comparison of a building in Hakodate, Hokkaido in the late '80s. Despite being on such a small scale, Matsuba’s work is truly impressive. Did we mention the man just does this as a hobby? We imagine he’s very detail-oriented at whatever he actually does for a living! If you just can't get enough of Matsuba's tiny dioramas, be sure to visit his twitter page. Artist gives anime and comic characters stained-glass look—with stunning results!